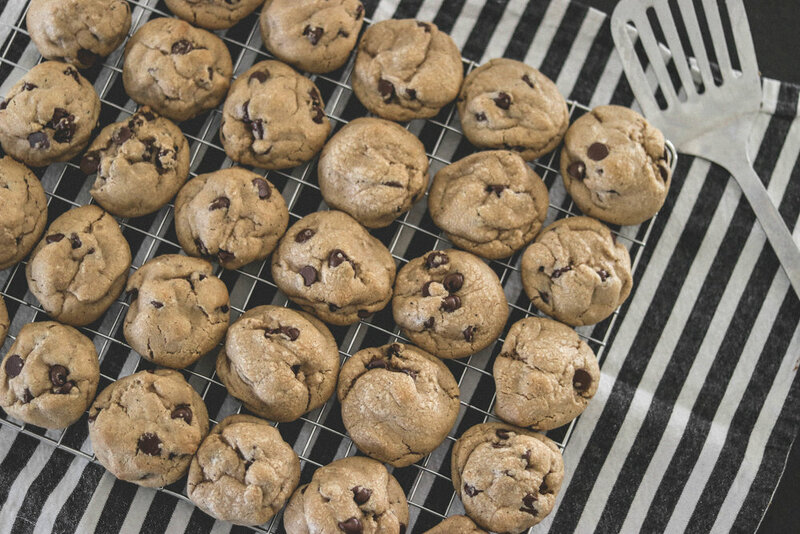 Brown Butter Chocolate Chip Cookies — shelbey w.
Turns out brown butter was the answer. I only tweaked my original recipe slightly to come up with the brown butter version. These are slightly sweeter and richer than my classic recipe. I picked up a couple of pointers from Joy the Baker’s recipe as well. Add 1 stick of butter to a non-stick sauce pan and melt on low to medium heat for about 10 minutes. Whisk frequently making sure the butter browns evenly. You’ll notice the butter will foam half way through cooking, this is normal. Once butter starts to pop, turn your heat on low and remain whisking until the butter is a rich opaque brown shade. Remove from heat and pour brown butter in a heat-safe bowl. Cool brown butter for 20-30 minutes. While brown butter is cooling, beat 1/2 stick softened butter in a large bowl for 1 minute. Add dark brown sugar to your bowl and cream the mixture together (beat the mixture) for one minute. Add vanilla, maple syrup, and honey - beat for 30 seconds. Once brown butter has cooled, add to your large bowl along with granulated sugar. Beat mixture until smooth. Add egg and egg yolk and beat for 10 seconds. In a separate bowl add flour, baking soda, and salt. Mix together then slowly fold into batter.